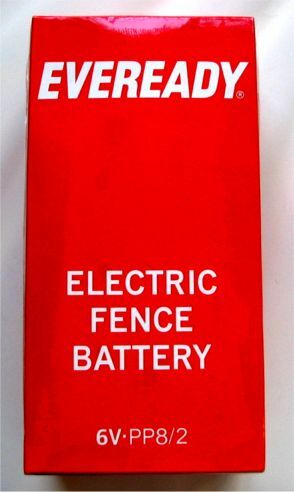 PP8-2, PP8/2 6V Electric Fence Battery Double PP8. Type: Carbon Zinc. Voltage: 6.0 V.
Depth: 63 mm. Width: 100 mm. Height: 200 mm. Price: £20.50 each. Postage and packing included. Also known as: PP8/2, PP8-2, Double PP8. This Carbon Zinc PP8-2 (PP8/2) has two pairs of large snap connectors and is commonly used in alarms, fencer equipment and vintage radios. The PP8-2 (PP8/2) is widely used in the agricultural industry to power electric fences. The PP8-2 (PP8/2) is used in 6v energisers such as the "Hotline Harrier Energiser", P1 Kestrel and P150 Harrier fence energisers. This double-PP8 will replace a PP8 battery if there is sufficient space available. 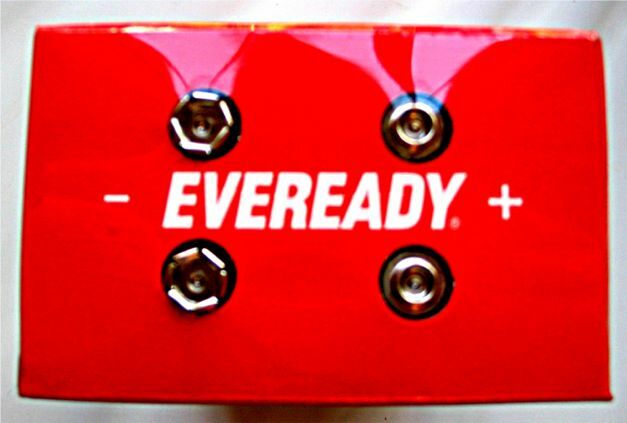 It is twice the size of the standard PP8 which, unfortunately, is no longer available from Eveready. The PP8/2 is effectively two PP8 batteries in one box.